Potential improvements in St. Albans, Queens, include storm water bump-outs and subsurface storage. Climate change challenges a fundamental principle of storm water management: the assumption of stationarity. Of course Earth’s climate has never been stationary, but for decades we have worked under the premise that our planning horizons are short enough to assume its existence and that the past is a reliable predictor of the future. So what should replace it? In 2016, following a series of analyses investigating this issue, the New York City (NYC) Department of Environmental Protection (DEP) embarked on a study to recommend an alternative. DEP’s storm water system is designed for the five-year storm and, like most of the U.S., based on intensities dictated by what are known as Intensity-Duration-Frequency (IDF) curves. The IDF curves used by DEP are adapted from U.S. Department of Commerce Weather Bureau Technical Paper 25 and derived from observed rainfall data between 1903 and 1951. In practice, DEP calculates intensity through what is sometimes referred to as the Steel formula—an empirical equation approximating IDF curves that was popularized in the days before computers. A 2013 analysis, performed for the NYC Wastewater Resiliency Plan, reassessed DEP’s IDF curves based on precipitation data at Central Park, John F. Kennedy International Airport, LaGuardia International Airport and Newark International Airport between 1969 and 2010. Despite a number of large storms in the 2000s, the analysis found no statistically significant change from those based on 1903 to 1951. For the 2016 study, the analysis was repeated using data from Atlas 14, the National Oceanic and Atmospheric Administration’s newest precipitation frequency database, recently released for New York state based on observed precipitation through 2014. Once again, practically no difference could be discerned, suggesting historically stationary precipitation extremes in the NYC area—at least for the short-duration storms for which sewers typically are designed. Nonetheless, numerous examples of positive trends in design storm intensities exist in the peer-reviewed literature for regions including the northeastern U.S. A supplemental analysis for 12 locations within a 50-mile radius of NYC failed to detect a trend for the five-year storm but detected an increase of approximately 15% since the 1950s for the 50-year storm. From a physics perspective, warming temperatures increase the water-holding capacity of air. The implication is more intense precipitation events, and most predictions from global climate models (GCMs) bear out this effect. To transfer these predictions to engineering applications, DEP leveraged data provided by Cornell University’s Northeast Regional Climate Center, which received funding from the New York State Energy Research and Development Authority to generate IDF curves from downscaled GCM data for more than 150 weather stations in New York state. Under a Representative Concentration Pathway (RCP) 8.5 scenario-considered the most extreme of the emissions scenarios-the projections suggested increases in the five-year rainfall intensity of 4% to 23% by 2040 to 2069, and 4% to 32% by 2070 to 2099 for durations of one to 24 hours. Further analysis indicated these projections were consistent with those derived from downscaled GCM data issued by the NYC Panel on Climate Change. The results of the study were used for NYC’s Climate Resiliency Design Guidelines, which provide recommendations to incorporate forward-looking climate change data into the design of all city capital projects. Adapting a storm water system for increasing rainfall intensities presents a unique set of challenges for any municipality, let alone one as big as NYC. In some fortuitous cases, existing sewer lines may already have sufficient capacity to accommodate projected increases in corresponding runoff. However, in other cases, projected runoff rates may exceed design capacities. The logical next step is to examine increases to either slope or diameter, but even if this is possible, changes to downstream segments also may be required, resulting in a domino effect that quickly renders the solution unfeasible. In such cases, measures such as source controls or overland conveyance can offer a more practical solution, and NYC has begun implementing these strategies to improve the resiliency of its storm water system. Source controls typically are associated with green infrastructure (GI). In the context of storm water management, GI primarily promotes infiltration, thereby reducing runoff before it can enter the sewer system. In NYC, the official objective of GI is to reduce combined sewer overflows (CSOs), with the goal of achieving 1.67 billion gal of CSO volume reduction per year by 2030. However, given the prospect of accelerating rainfall intensities, it is increasingly being considered from a resiliency angle, as well. In 2017, NYC kicked off a pilot program to modify GI for managing storm events above the current five-year intensity. A key element of this pilot program is an approach known as cloudburst management, pioneered by the city of Copenhagen, Denmark, in response to devastating floods in 2011. The philosophy of cloudburst management is that parks and other open space that provide recreation during dry weather can be optimized for their capacity to mitigate flooding during wet weather. 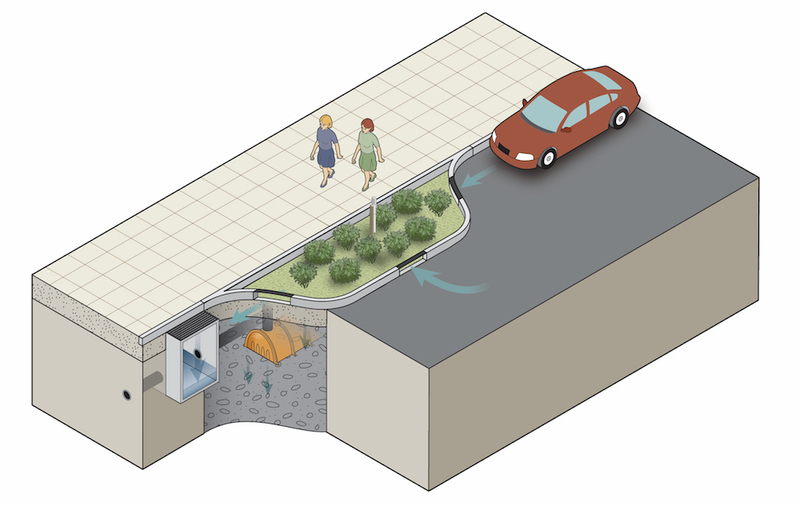 These multifunctional spaces can be designed to serve as detention basins, fed by overland conveyance in street medians and other drainage corridors that collect storm water from targeted problem areas. By integrating flood control projects with the enhancement of public space, the approach can achieve greater urban value and co-benefits for capital investments. In NYC, it bears similarities to DEP’s Staten Island Bluebelt. Drawing upon the success of the Copenhagen program, NYC performed its own cloudburst management study for the southeastern section of the borough Queens, a part of the city that experiences chronic flooding. As described in the NYC Cloudburst Resiliency Planning Study, a cloudburst master plan was developed based on hydraulic simulations, risk mapping and stakeholder input provided during a series of workshops. A second set of simulations incorporating the master plan was then supplemented with a cost-benefit analysis to evaluate the proposed interventions. Ultimately, two areas were selected for the cloudburst pilots—the St. Albans neighborhood, a low-lying area prone to frequent flooding, and the South Jamaica Houses, an area managed by the NYC Housing Authority. In St. Albans, flooding was found to result partially from runoff bypassing catch basins in tributary streets. Selective regrading has been proposed, possibly in the form of raised crosswalks that would serve to divert runoff away from low-lying areas while providing co-benefits of traffic calming. Once the tributary runoff is redirected, additional measures could include subsurface storage. Proposed improvements in the South Jamaica Houses center on a new storm water corridor through an underutilized space adjacent to the housing area. The corridor would maximize green space while maintaining a unified aesthetic, providing a mixture of surface and subsurface retention to slow rates of outflow into the storm sewer system. Both systems would be designed for the 10-year rainfall intensity projected for 2050, roughly equivalent to today’s 25-year rainfall intensity. Conceptual plans for the South Jamaica Houses cloudburst pilot are now being presented to residents. Beyond providing a forum for local citizens to contribute suggested design elements, a key issue is whether they are willing to accept temporary ponding in addition to the co-benefits the modifications would provide during dry weather. Nonetheless, an integrated approach blending traditional grey infrastructure with GI and cloudburst management systems offers a promising pathway to greater resiliency. However, fundamental questions remain. One pertains to the future storm intensities on which the designs should be based. Our understanding of the Earth’s climate is far from perfect, and GCMs have drawbacks when it comes to simulating extremes, not to mention the great deal of uncertainty that exists with respect to greenhouse gas emissions. It is likely that predictions will continue to evolve. Even more fundamental is the concept of risk itself. Inherent in any design for an event with a given return period is a computable risk of an event exceeding that design occurring over the life of the facility. Clearly, this risk is changing.